Separate each pita into 2 layers, then cut them into eighths. Arrange them in a single layer on baking sheets and brush them on one side with olive oil. Trust me, you do not want to toss them with olive oil, I tried this method first and it was an oily mess! Sprinkle them with sea salt and bake at 350 degrees (175 for my Euro readers) for 20 minutes or until they’re crispy. I thought about brushing them with garlic-infused olive oil and herbs, but let’s face it, the main purpose of these chips is to get hummus to my boca, so why complicate it? 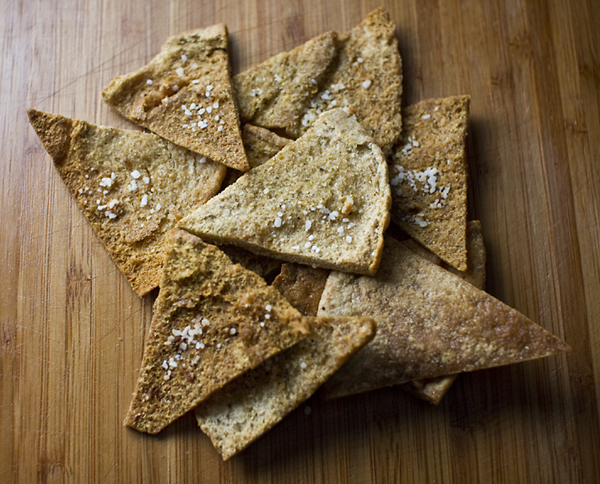 What a great idea to make your own Pita chips! I’ll have to try this soon, and also look forward to seeing your new hummus recipe. I need to try this,it looks easy peasy. I made these and they are delicious. I overcooked the first batch and oversalted a tad, but will know better next time. I’ll be making them again.